Kevin the cat has a craving. He wants custard. But how is he going to get his ‘waiter’ to bring him a bowl of glossy, golden custard? He is not too proud to go through all sorts of antics to get what he wants. But what does he have to do to get his human to understand? Spell out custard with his body? Maybe he'll just have to get it himself. This is a book to make you smile. It made me laugh aloud in many places, especially thinking of the cats I know. I'm sure if I could hear their thoughts, they would be just like Kevin -- aloof and sarcastic. ...and I've got some nice sharp claws to scratch your leg. Really? I should go about with fish breath? This is a picture book which relies on both text and pictures to bring it to life. The text is spare and to the point, often in speech bubbles, and goes perfectly with the illustrations. These are very bold and very bright, and like the text, spare without unnecessary detail. They express the frustration of Kevin so wonderfully, while we only ever see a glimpse of his human, a pair of legs or a hand. 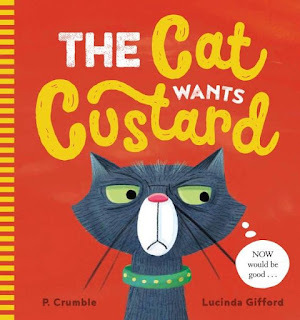 This is such a fun book to read aloud and children as young as three will love the dry humour and demands of Kevin the cat - possibly recognising a tiny bit of themselves in him.